I was very pleased to be offered the chance (thanks to Midas PR) to try out this a brand new release from Audible.co.uk, starring Rafe Spall (Prometheus and Life of Pi), Adrian Lester (Hustle and Merlin) and Natasha McElhone (Californication and The Truman Show). If you enjoyed The Child, you’ll love AMOK, which is from the same author, bestselling novelist Sebastian Fitzek. Narrated by Robert Glenister, along with a full cast, soundtrack and some great sound effects along the way, I thoroughly enjoyed the eight hours running time like a fine dvd box set -indeed, I did find the depth of story and compelling characters akin in many ways to the best of the finest Nordic Noir we enjoy on the tv. 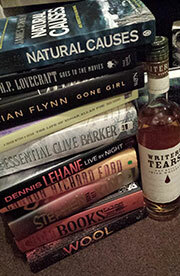 But, the major benefit here is the fact that this entertainment is completely portable – yes, even easier to carry around and enjoy than an ebook in many respects. Based on Sebastian Fitzek’s best-selling novel Amok Spiel, the thriller follows an intense hostage situation unfolding at a radio station where a crazed psychopath, Jan May (Adrian Lester), initiates a morbid mind-game. While the show is on air, he calls members of the public at random. If they pick up the phone with a certain phrase, a hostage is set free. If they don’t, a hostage is shot live on-air until the killer’s demands are met. Struggling with her own personal demons, renowned criminal psychologist, Ira Samin (Natasha McElhone) is called upon by her former fling Olivier Götz (Rafe Spall) – leader of a Special Operations Command troop – to assist in the harrowing circumstances. A specialist in the field, Ira faces a seemingly futile negotiation, played out to millions of transfixed radio listeners. 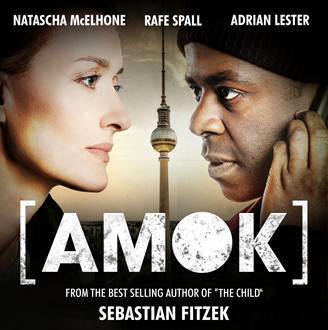 Amok is award-winning writer Sebastian Fitzek’s second title available on Audible.co.uk; his first, the original audio drama The Child, launched in August 2014 and remained in the top-selling position for three consecutive weeks. Fitzek’s first book Therapy (Die Therapie) knocked The Da Vinci Code off the number one spot in his native Germany, whilst Fitzek’s novel Splinter was included in the 2014 Sunday Times 50 Best Crime and Thriller Books. Also starring in Amok is Robert Glenister (Spooks) as narrator, Brendan Coyle (Downton Abbey) and Peter Firth (Spooks). Amok is available on Audible.co.uk, as well as Kindle Keyboard, Kindle Touch, Kindle Fire, the Audible apps for iOS, Android, and Windows Phone 8, PC, Mac and some MP3 players.